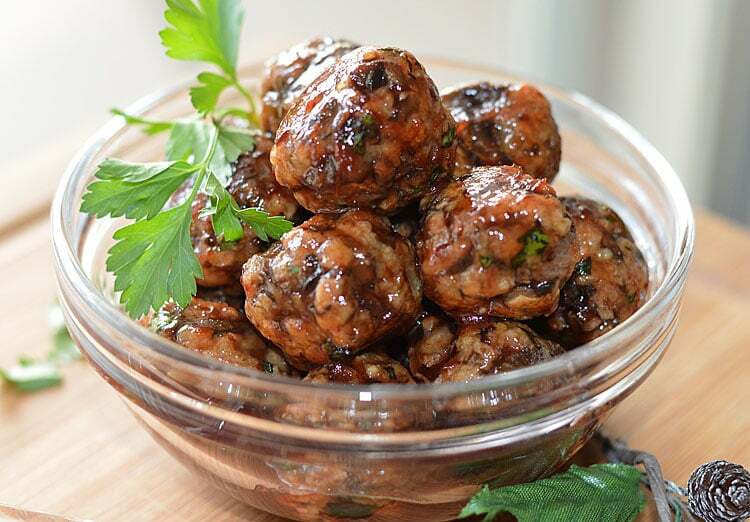 When I came up with The Perfect Meatless Meatball, I began to realize just how versatile the recipe really was. And one of my favorite holiday foods was always Sweet and Sour Appetizer Balls, so naturally…I had to see if it would work. These meatless wonders are super easy to make. I actually double the recipe, cook them and then freeze for whenever I want spaghetti or a sub. Because they are pretty neutrally seasoned, they take on whatever flavors you add to them. 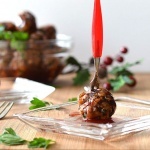 The first time I made them, I chopped the mushrooms much finer and they do hold together better that way, but I much prefer the chunkier chopped mushrooms because it really gives that texture I was looking for. Either way, they taste delicious. I did update the original recipe and added grainy mustard and a vegan-friendly worcestershire. I think it really added to the depth of flavor. You could (and should) use this recipe as a base and add any seasonings that you like to make it your own. So here they are… They were pretty amazing and I’ll definitely be making them again. 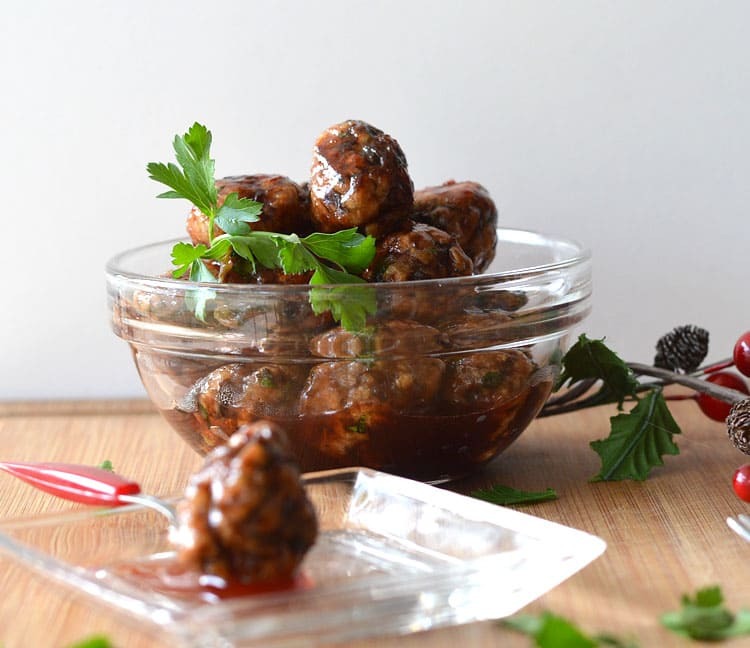 For a step-by-step tutorial for the meatballs, you can click here, however the entire recipe appears below for your convenience. Prepare mushrooms by removing stems, wiping clean (or giving a super quick rinse under water and drying with paper towels if really dirty). Dry completely. Using a knife, not a food processor, chop mushrooms into a fine dice. No large pieces. In a skillet on medium-high heat, add the oil and chopped mushrooms. Season immediately with salt and pepper. The salt will draw out the moisture in the mushrooms. Continue to cook until all moisture has evaporated. Meanwhile, dice the onions finely. In a separate saute pan, add the vegan margarine and the onions. You can reduce the heat to medium at this point. Cook, stirring frequently, until onions are tender and just starting to caramelize. They should be soft and moist, golden in color, but not crisp. You can add additional margarine if necessary. 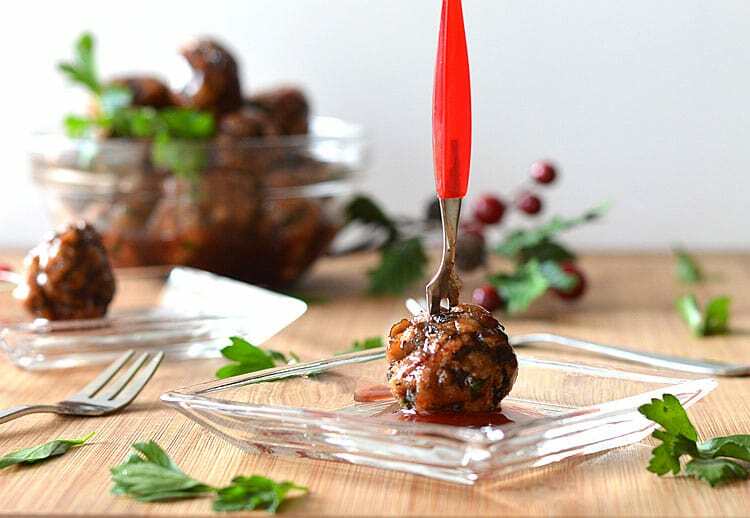 NOTE: You could add the onions directly to the mushroom mixture to cook, but I really feel like the separate cooking time allowing them to caramelize adds to the depth of flavor of the finished meatball. Add onion mixture to mushroom mixture, which should now be golden brown. Remove from the heat and stir in the minced garlic. It will cook a little from the residual heat of the pan. Prepare the flax "eggs" by combining the ground flax with water and allowing to sit in the refrigerator. It will become gelatinous and be our binder for the meatballs. Transfer to a mixing bowl and allow to cool slightly. Add the oats, vegan parmesan, bread crumbs parsley and flax mixture. Combine with a fork until coarse and crumbly. Add the mustard and worcestershire. Season with salt and pepper. Add oregano if using for pasta and sauce. 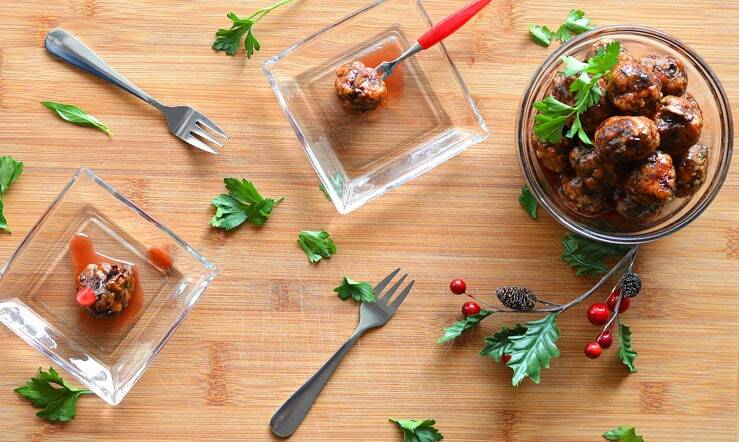 Omit if using for an appetizer, such as sweet and sour meatballs. At this point the mixture should hold together. If it seems a bit dry, add another Tablespoon of water (or you could add a splash of almond or coconut milk). Cover with plastic wrap and refrigerate for several hours. Preferably overnight. This will allow the moisture to permeate the dry ingredients and the flavors to meld. Using a small scoop, form uniform balls onto a lined sheet pan. Using moist hands, roll into smooth meatballs. Bake for 10-15 minutes. They should be slightly golden but not browned. To make the sweet and sour sauce, heat chili sauce and a vegan-friendly grape jelly in a saucepan until combined and fluid. Add the meatballs to finish heating them through in the sweet and sour sauce. I try not to stir too much to avoid breaking them up. Since we are not using eggs or raw meat here, they just need to be heated through and hold their form. These have so many awesome flavors thrown together. I love when one recipe can be used multiple times in different ways! Definitely trying half finely chopped and half roughly chopped to see the difference. I love mushrooms so either way it is going to be amazing. Yum! I like the sound of the sweet and sour sauce these are in! What a great appetizer idea! I thought Worcestershire sauce had anchovie in it….